A selection of websites (in random order) where books, reviews and covers can be found. These sites also serve as a news and reference source for my site. For copyright reasons I do not include the reviews on these sites, but provide a link and credit to the author(s) where possible. As internet pages come and go or change their purpose, I once in a while check if they still exist. The date of the last check is shown. The websites linked below are not under the control of ElvisBooks. We have no control over the nature, content and availability of those sites. The inclusion of the links does not necessarily imply a recommendation or endorse the views expressed within them. » Elvis in Print by David Neale [last checked 13-10-2018]. Contains short reviews of more than 360 books and other publications concerning Elvis. Gives a very good first impression of a book. Includes David's in-depth reviews for a number of books. Book covers available for about 40 rare books/publications. Good companion. » Elvis History Blog by Alan Hanson [last checked 13-10-2018]. "There're a million different Elvis books out there. Well, that's probably an exaggeration, but certainly there has been a flood of volumes published about the man since his death in 1977. And there's no end in sight. 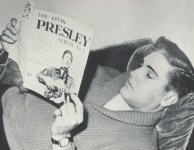 In 2007 an average of two Presley books hit the market each month. The problem for those seeking credible information about Elvis is this: Which books are worth reading? Which ones tell the truth?" » Publishers Weekly [last checked 16-10-2018]. Many reviews of Elvis books. » Echoes of the Past by Bob Pakes [last checked 13-10-2018]. » Elvis News.com [last checked 13-10-2018]. The website for the latest Elvis news. Reviews of many books. » Elvis Information Network [last checked 13-10-2018]. Reviews of many many books. Website owner Nigel Patterson is (was?) working on a book on Elvis related books. Publication date yet unknown, but it was expected somewhere in 2007. EIN had a special on Elvis books in 2006, with reviews of rare Elvis books and specials on Sean Shaver, Paul Lichter and Joe Tunzi. » It's Elvis Time by Freia Roos en Peter Haan [last checked 13-10-2018]. The Dutch Elvis fan club. Founded in 1962, in existence for over 50 year now! » Elvis Corner by Johan & Cherry [last checked 13-10-2018]. Dutch Elvis Shop. Has a large collection of new and 2nd-hand books. Certainly worth a visit! But watch out while navigating through the maze of Elvis books and memorabilia, you easily get lost in time and space. » Elvis Club Berlin e. V. [last checked 13-10-2018]. Large German Elvis site. Also latest book news in section "Bucher". Review in German and English language. » Elvis is Still Active in Norway by Oven Egeland [last checked 13-10-2018]. Lists several, more recently released, books with a short description. » For Elvis CD Collectors Only by Willem Kaauw and others [last checked 13-10-2018]. Started about 20 years ago with only a bootleg section, now it has turned into a major Elvis website with a couple of updates everyday. Some reviews of books released in the last couple of years. Good quality reviews. » Elvis Australia [last checked 13-10-2018]. Has besides the latest news, a large book section with a short description and front cover. » Elvisunique.com by Paul Lichter [last checked 13-10-2018]. Some hard to get books. » Elvis Book Club - Elvis Books [last checked 23-01-2017]. Discussion board only focussed on Elvis books. You have to be a member to participate. » Elvis Presley's 78's Around the World by Andre Helling [last checked 13-10-2018]. Has an interesting list of books focussing on Elvis's record releases around the world. » Elvis Presley Gesellschaft e.V. [last checked 13-10-2018]. » Elvis Book Covers [last checked 13-10-2018]. Book covers! Currently about 400. Seems to be related to Amazon and ebay. » Google Books [last checked 13-10-2018]. Google books, some of them with preview.